Increase your vaporizer knowledge and compete for awesome prizes each month! The dense, purest vapor that comes out from the Arizer Solo Vaporizer truly gives a warm, lingering pleasure to the senses. Supported by a sleek aluminum casing in black or silver, this portable vaporizer is the perfect device to release the genuine flavors of your herbal concoction or other medication. Two detachable diffuser tubes made of glass are bundled in with the package to hold your grounded herbs. If you are seriously into aromatherapy, a potpourri dish is also conveniently provisioned. Simply open a small rubber port to hold the diffuser tube firmly in place and you are good to go. The Arizer Solo Vaporizer features a ceramic heater core that heats up real quick for the utmost efficiency. It only takes around two minutes to reach each of its seven temperature settings that you can manually adjust to your liking, from a temperature of 185°C up to the maximum temperature of 210°C. It has an LED Temperature Control System which clearly displays the current temperature of the vaporizer. 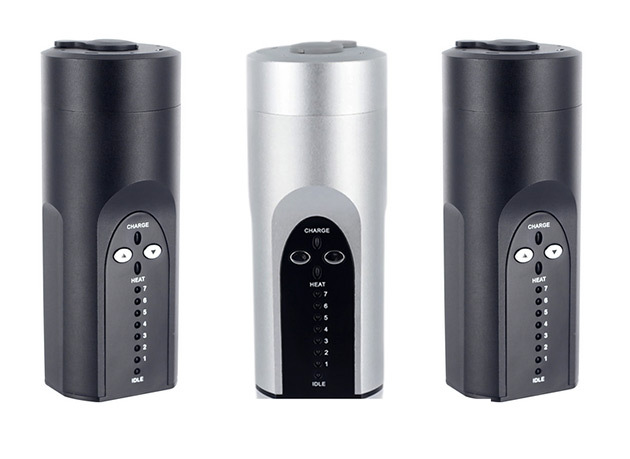 While others are still using butane, a highly advanced feature of the Arizer Solo Vaporizer, that sets it apart from its counterparts, is that it is powered by a rechargeable lithium ion battery which can last for over six hours of continuous usage. It is indeed a remarkable battery life from a compact vaporizer that you can discreetly fit into your own pocket. With its portability and sturdy casing, you can easily bring it with you anywhere. Whether you are new in the art of vaping or an old timer, the Solo Vaporizer will be your reliable companion for years to come. It is touted to be the top of the line portable vaporizer from Arizer Tech (Canada) in terms of craftsmanship, but with an affordable price attached to it.